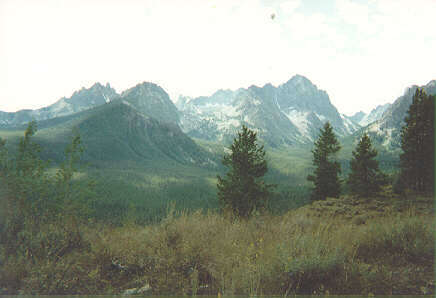 Thompson Peak is the highest peak in the Sawtooth Mountains in Idaho at about 10,750'. 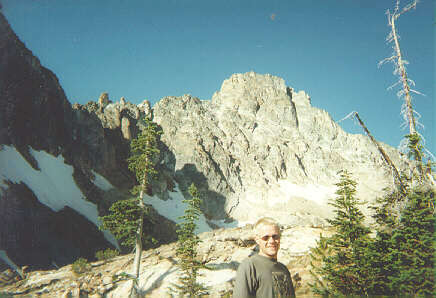 I climbed it with my friend Fred Willerup in mid-September of 1997. 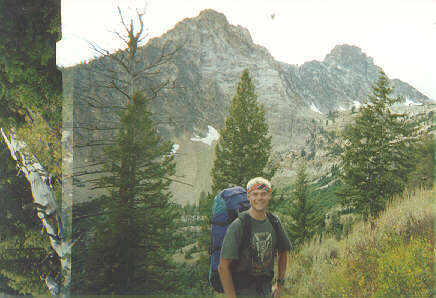 We backpacked in the first day about 4 miles to a lake at 9000' where we relaxed and fished. I caught two of the most beautiful fish I've ever caught in this lake. They were about 15" long and FAT...FAT...FAT!!! They were also very strong. 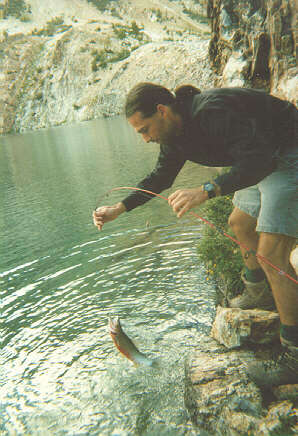 They were cut-throat trout and they must have been spawning or something because their stomachs were an incredible reddish color. 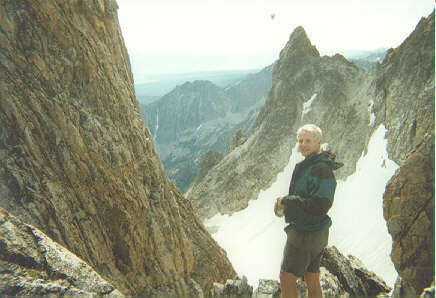 The following day we started our peak assault at about 10:30am and summitted around noon. It was a fantastic hike. From the lake you go up to the saddle at the head of the valley and then wind your way around the back of the peak. You don't need ropes; just a bit of scrambling is required. 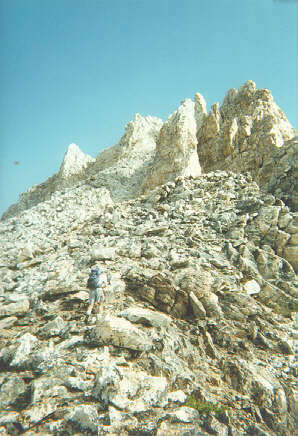 The whole time you're climbing you're looking at the peak wondering "how the hell are we gonna get up THAT!" But after winding around the back the way up is fairly obvious. After summitting we went back down to camp, got our stuff together, and hiked out in time to enjoy a cold one in the parking lot by 4:30pm. 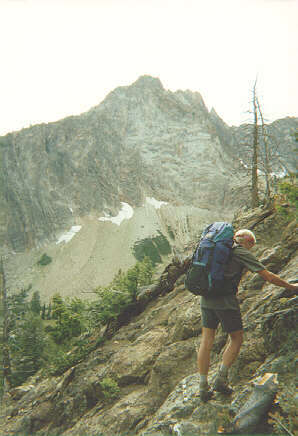 The vertical gain on this hike is about 4,200'. It can be done in one long day. If you want more specific directions this hike feel free to email me. 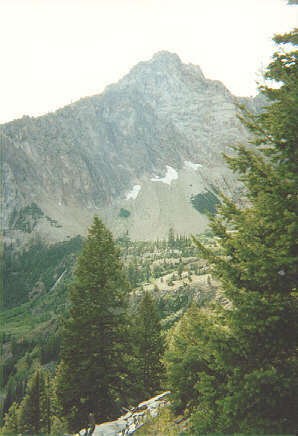 This is looking up the valley at the peak (right of center). A little side-hilling up the right (north) side of the valley. 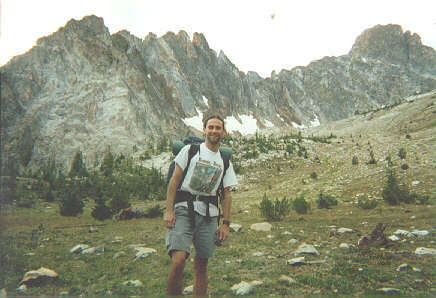 Below the lake which sits in the cirque right above and to the right of my head. The beautiful lake. 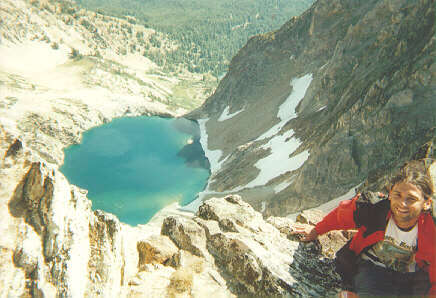 It is unnamed but referred to by the locals as Goat Lake. I really, really wanted to see a goat but never did. Note the bridge that forms the lake; one solid, thin piece of stone. 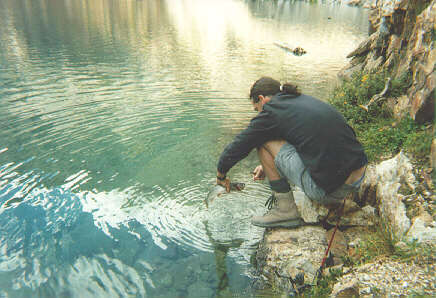 Fred by the outlet stream. 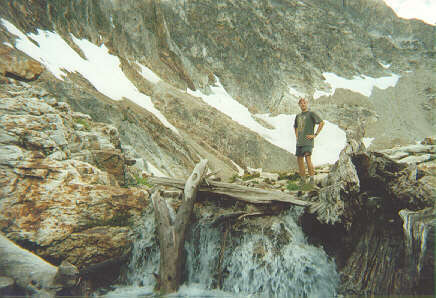 Pretty typical of a Sawtooth lake outlet stream: a bunch of logs congested around the water's exit. 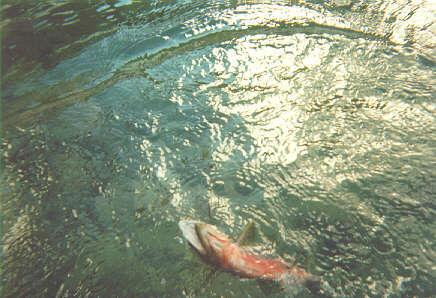 This is fish number 2, the smallest. Our camp. 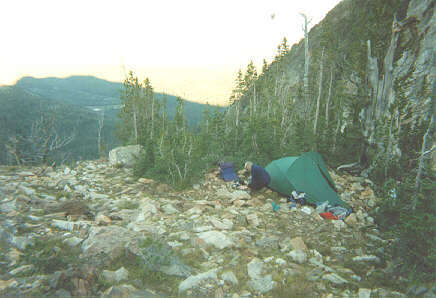 There were only two campsites near the lake. 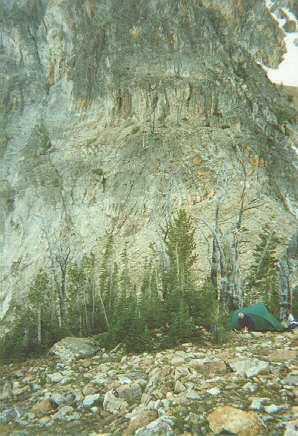 Although this one looks rocky someone had cleared away a nice tent site. This one is near the exit stream. Fred in the foreground, the object of our assault in the back. This was taken the 2nd day right after we started hiking to the peak. Looking south-east after winding around the back of the peak. From here it is a straight scramble 200' to the peak. Me in the same spot. 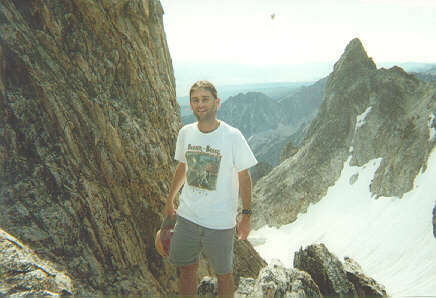 This was taken about 15' below the summit. 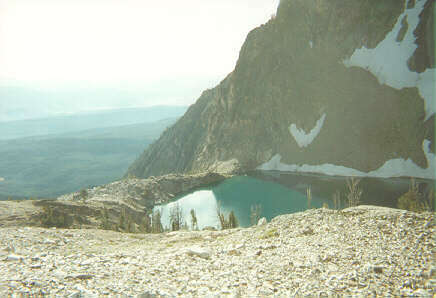 The lake at which we camped is 1700' (almost) straight down. 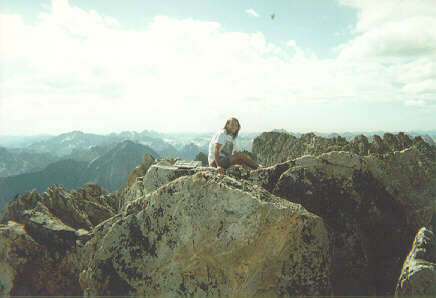 Me at the highest point in the Sawtooths!!! 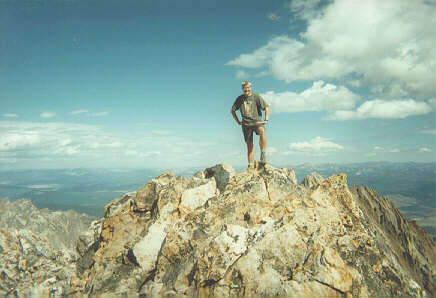 Fred at the highest point in the Sawtooths!!! 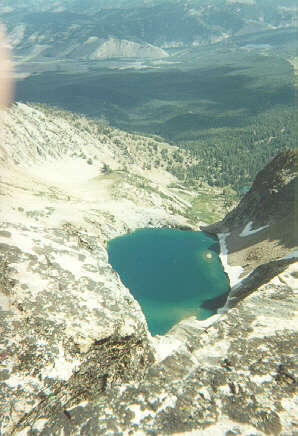 Another view of the lake from the summit. 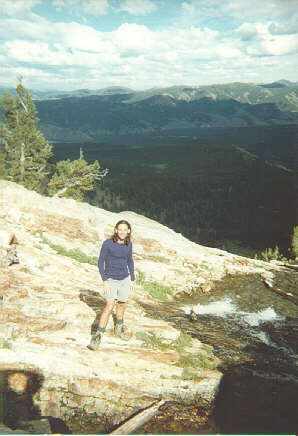 You can see our starting point, near Little Redfish Lake, in the upper right. This is a nice view of the valley you walk up to get to the lake.